Campingplass Domaine de Soleil Plage er en campingplass i Vitrac, Dordogne, som ligger ved en elv/bekk. Denne campingplassen har steder med avgrensning, med skygge og plasser med noe skygge. Camping Domaine de Soleil Plage ligger i nærheten av en sandstrand og en steinstrand. Det er mulig å leie stasjonære campingvogner, vandrerhytter og hytter. Campingplassen har lekeplass og idrettsplass. For sportslige feriegjester arrangerer campingplassen ulike sykkelturer. Det er underholdningsprogram. For dem som vil slappe av etter en travel dag er det boblebad. Campingplassen har badeland, utendørs svømmebasseng, innendørs svømmebasseng med skyvetak og barnebasseng. Det er også vannsklie. I nærheten av campingplassen kan man svømme i en elv/bekk. Denne inspektøren besøker hvert år Campingplass Domaine de Soleil Plage og inspiserer campingplassen for ca. 200 fasiliteter og for andre punkt som forekommer. Inspektøren er en medarbeider fra ACSI og arbeider ikke for campingplassen. We have been to this site as a couple for 3 years, though my husband has been many times before. The site is lovely, very clean and well kept, in a lovely location. There are plenty of activities including several swimming pools to keep everyone occupied. This is one of the most beautiful spots I have ever visited. The site is a lovely size with friendly staff and good facilities. Access is not the easiest; the main road ( from whichever direction, is narrow, twisty and has overhanging rocks making it impossible to see oncoming traffic......and drivers whip round the bends!). The staff were pleasant but seemed to have no knowledge regarding which plots had some sun; most plots are heavily shaded and, as a previous reviewer stated, this may be fine in high season but in low season it is not welcome. Furthermore, the plots were plagued with worms; this was a real problem and made it impossible to sit out. In contrast, the pool complex was gorgeous. A final point, it was a pity that( remote as the campsite is) the owners chose to close the restaurant and shop...surely a reduced menu should have been on offer?? Finally, the toilets were fine but having come from Spain with beautifully tiled toilet complexes, cleaning spray available on the wall to clean the toilet seat and cleaners around until 10 pm, these hardly cleaned toilets ( sometimes the cleaners simply replaced toilet rolls and departed!) fell short of expectations for a 5 star site. We planned to stay here for about a week max. The lady on reception was very friendly and spoke English. She informed us that the shop bar and take away were all closed.We were allocated a pitch for our 8m caravan. Having inspected it on foot we found it to be totally enclosed by a 6ft hedge (as were most of the pitches) and shaded by trees. This may be ok in summer but not in September if you're trying to enjoy the last few rays. We found a sunny pitch but could only stay there for 3 nights as the toilet block was being closed. Moved after 2 nights. A splendid campsite with large and well maintained pitches. This is a very attractive site within easy distance of many of the regional attractions of the Dordogne but is also lovely just to stay on site and relax. The restaurant serves excellent food at reasonable prices and the takeaways are very good. Sanitary facilities are of a high standard and the pool complex is splendid. Vil du booke Campingplass Domaine de Soleil Plage eller få mer informasjon? Det går bra med opplysningene nedenfor. 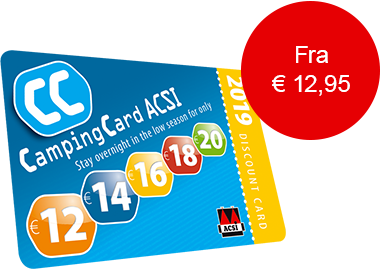 ACSI Eurocampings sender din forespørsel til "Campingplass Domaine de Soleil Plage".